Sewing is not only wonderful it is messy! Tidy up with these 3 inexpensive sewing room storage tips! My sewing studio is a labor of love. It has taken over a decade for me to create a space that is functional, practical and still has my sense of style. Luckily for me, my sense of style is vintage funk! My first tip is vintage luggage! I use vinatage luggage all over my house for storage. Each of the cases here were found at local thrift shops for less than $6. 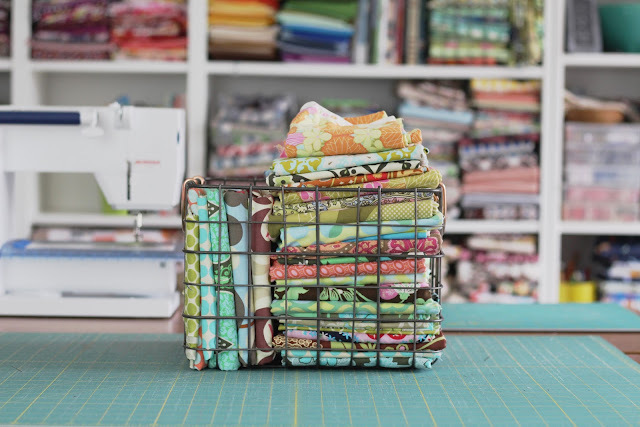 I store patterns, quilt blocks and vintage fabrics in them to keep it looking sharp! Garage sales and thrift shops are also a great source for baskets. Baskets are fab for blocks, threads, notions of all types and photo shoots. these are all Longaberger ( and there are more in my studio) that were purchased for less than no more than $10 each. the small ones were $1 each. The ball jar was free from someone and it is perfect for my paintbrushes. 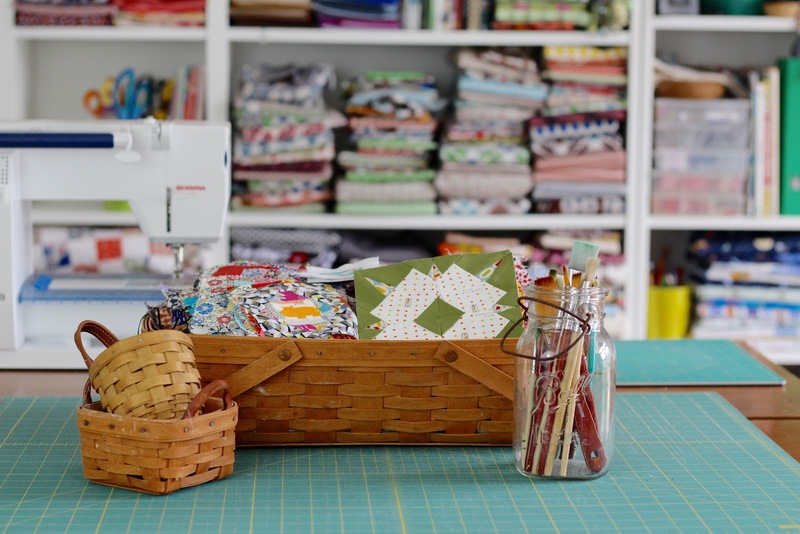 Look outside of the craft stores for inexpensive containers for sewing/ crafting tools! These planters were found at a home improvement store on clearance for $1-$3 each. They add a POP of color at an amazing price! In the clearance section in Target, I find wire baskets all the time. They are wonderful for holding fabric without toppling over, they are portable and durable. This has to be my most favorite storage tip! 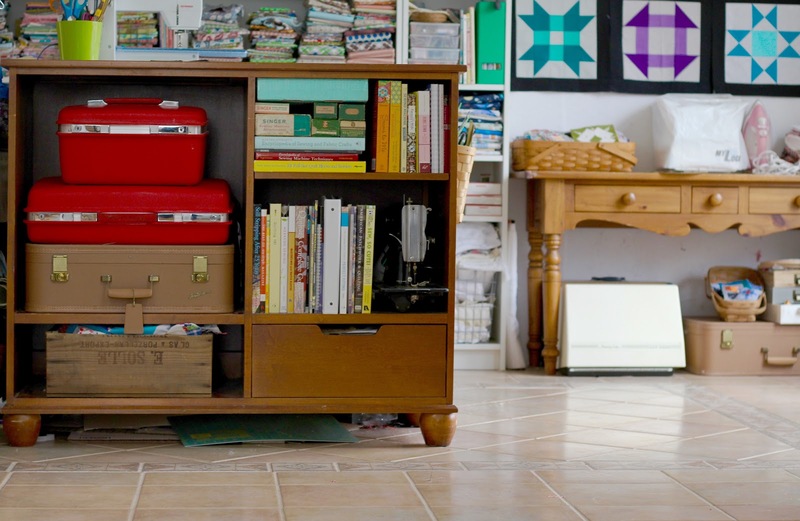 One of these days I will have a full sewing studio tour but until then, you can see more of my thrifty sewing studio my visiting 7 Thrifty Storage Ideas! 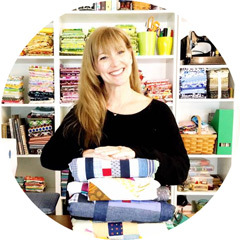 What do you have in your sewing room that you love! 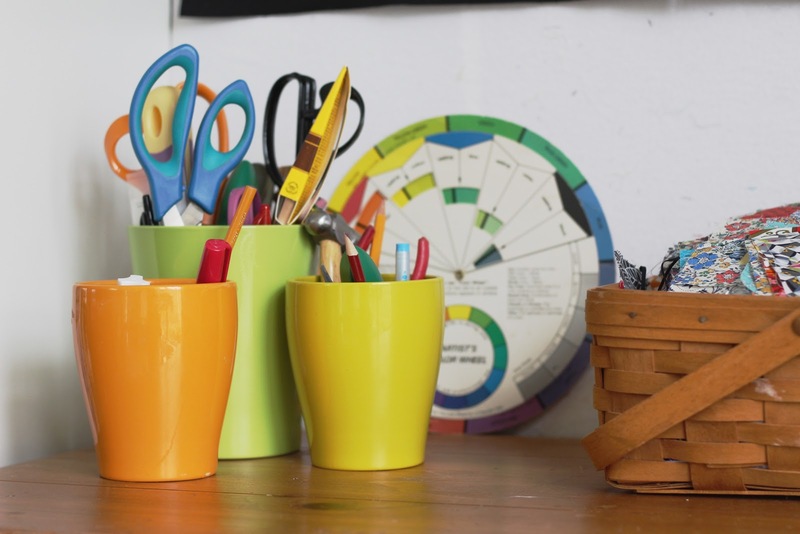 Colorful plastic bins from the Dollar Store are great for organizing, too. I love pretty containers and am always on the lookout for them. Your vintage luggage is perfect! Since I was an Admin Assistant (aka secretary) for years, I was given a lot of coffee mugs for various occasions. I use some of them for stand-up tools: rotary cutter, chalk pencils, seam rippers, etc. Sometimes nice ones are available in a thrift shop or yard sale for a quarter each.